It may sound crass, but Russia is famous for its high-quality vodka, and the accessories that go with it (i.e. shot glasses) can be found in almost any Russian home. So if you know any vodka drinkers back home, getting them some nice Russian vodka and high-quality shot glasses makes a very authentic gift. We recommend going to a real housewares store for the best crystal shot glasses, but there’s nothing wrong with picking up a few that are embellished with a picture of the city you’re visiting—and these can be found at any souvenir market. Russia makes some incredible candy and chocolate, and you can find these for sale in almost any Russian shop. Sometimes you can even visit the factory and visit the shop there, as you can in Moscow (the ex-factory-turned-museum is called Krasny Oktyabr). You can’t really go wrong with Russian candy, but be careful when choosing chocolate—don’t go for the cheapest kind, and obviously don’t buy anything that is clearly not Russian (e.g. Lindt). If you or the person you’re buying for is religious, then you can pick up quite affordable gifts at most Russian churches. You will find a shop near the entrance where they also sell candles and postcards. Remember to be respectful, speak quietly, and not take up too much of their time. It might help to learn some basic Russian phrases as well since the stands don’t usually have English-speaking staff. 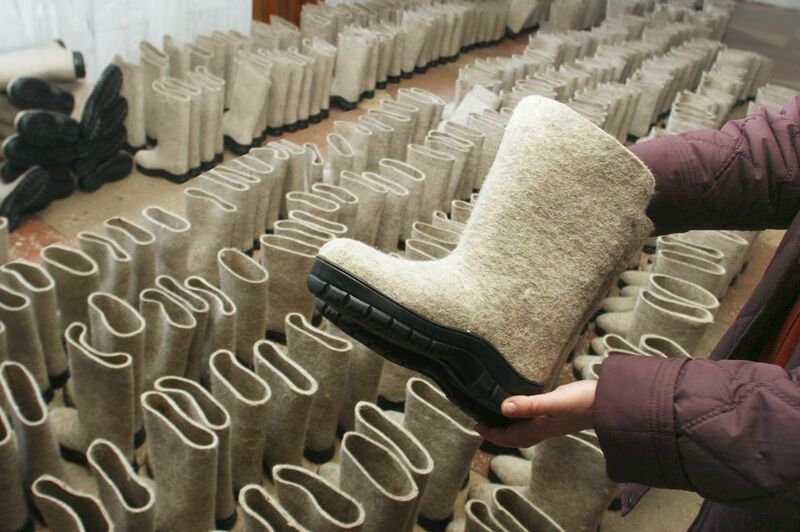 “Valenki” are traditional Russian winter boots, made out of sheep’s wool felt. They usually don’t have a hard sole, just one thick piece of grey felt, and are thus often worn with “galoshes”, or rubber boots. These days however you can find valenki combined with rubber soles to make a real shoe. One way or another, they are a gift straight out of historic Russia. They’re warm and they make great slippers and presents for babies and children. They’re usually quite inexpensive. In Moscow, you can visit the Gorizont valenki factory (2-y Kozhevnicheskiy Pereulok 12, Metro Paveletskaya) not only to buy them but also to check out the museum that will explain the history of the shoes. However, you can find them at standard souvenir markets as well. Russia is famous for its authors, poets, and playwrights, so naturally a great authentic and inexpensive gift to bring back for someone would be a Russian classic. You can find Russian books in translation in many bookstores. Don’t be afraid of going inside—if the store sells English books, there’s a good chance that one of the staff will speak English (and even if they don’t, it’s not that difficult to find and pay for a book without exchanging a single word).